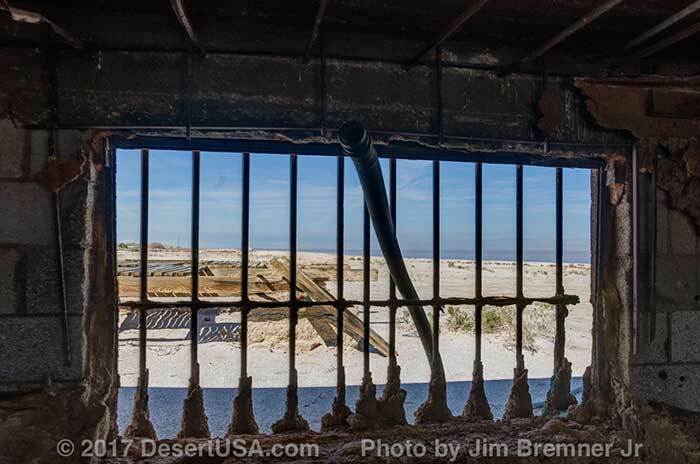 Over the years I'd heard tales of an old abandoned Naval Station on the western shores of the Salton Sea. Atomic bomb practice runs, movie sets, seaplanes and Navy seals were all said to have been part of its curious history. I decided to take a trip out there with DesertUSA staff to check it out. In preparation for our trip, we checked Google’s maps to find the best route there, and to scope out the territory; then looked at YouTube videos to see what others had come across. I’ve found this to be a good way to prepare for trips I know in advance what kinds of problems I might encounter. Most of the information we found was several years old. One person had mentioned being stuck in the sand on the way to the base, so we were a little nervous on the way out. On Route 86 on the west side of the Salton Sea, about 4 miles north of Route 78 we reached the turn off to our destination. I was expecting a dirt road and was pleasantly surprised to find a very old paved road instead. After about one and a half miles the road angled left toward the old base. We encountered some small sand drifts that had blown across the road, which we drove over. They were just a few feet high. The sand began to rise in height and before long we were looking at one that was 50 feet high and 400 feet long. After checking the sand to see how soft it was, we decided to proceed. Without the proper vehicle – and 4WD – you will not make it to the base. There are better ways to get to the base then this old road. Naval Air Facility Salton Sea was originally commissioned in 1942 as a seaplane base. Some say the seaplanes were the source of the barnacles in the Salton Sea. Paramount Studios filmed the war movie Wake Island here in the same year. In 1944 a runway was built for other planes and the base became a Naval Auxiliary Air Station connected to NAS San Diego (later renamed NAS North Island). It had barracks for over 600 men. In 1944-45 a series of classified B-29 practice flights were made from Wendover, Utah to the Salton Sea. At the sea, the crew dropped dummy atomic bombs onto a floating white raft and other targets. The first atomic bomb dropped on Hiroshima on August 6th, 1945 by Tibbets’ Enola Gay crew was based on a prototype first tested at the Salton Sea. The Atomic Energy Commission and its contractor Sandia Corporation acquired the base from the Navy in 1946. 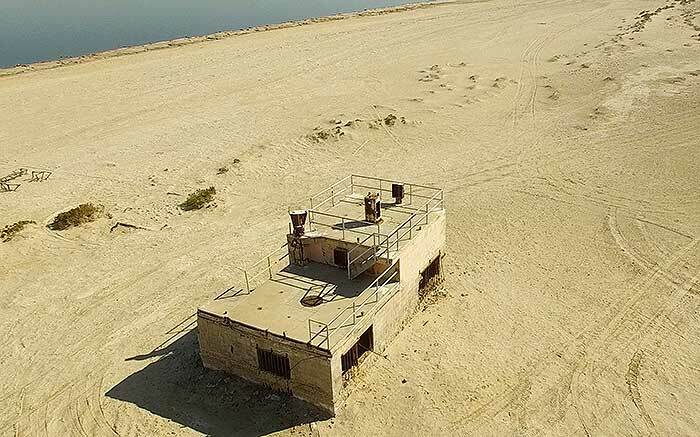 It was renamed the Salton Sea Test Base and used as a highly sophisticated bombing range whose drops were scrutinized and perfected using equipment reportedly recovered from Germany after World War II. Apparently the bombing tests included delivery from diverse devices, even from space capsule parachutes. Drone planes and Nike missiles were also tested there. Sandia has confirmed depleted uranium was present in some of the tests, but says fissionable materials were never used. The Salton Sea rose and the Imperial Valley became increasingly populated, making the location less and less suitable for testing. 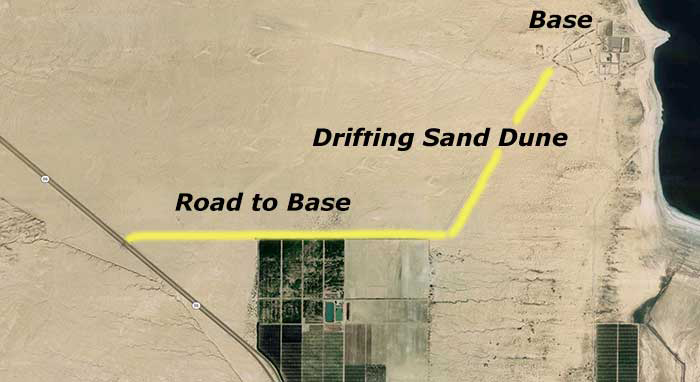 Sandia and the Atomic Energy Commission found a new, more isolated location near Tonopah, Nevada, and ceased operations at the Salton Sea Test Base in 1961. 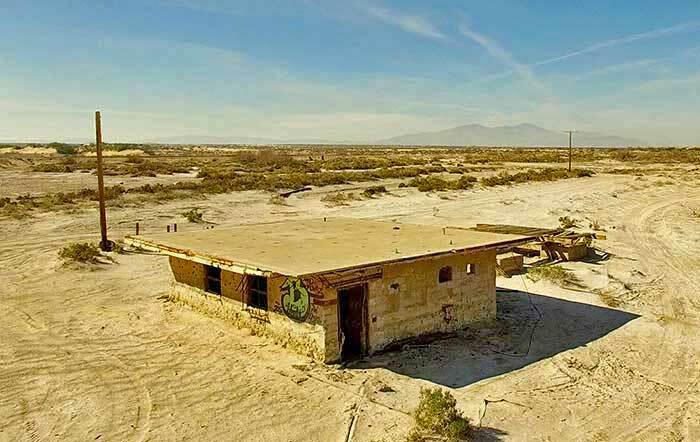 The Salton Sea location was taken over by NAF El Centro for parachute tests for the space program for awhile, and for Marine and SEAL training exercises, until 1979. 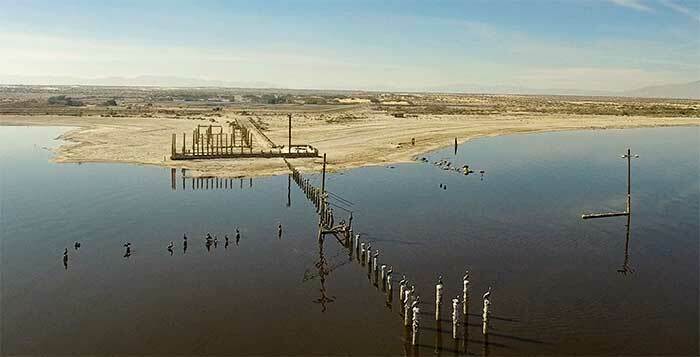 The Salton Sea was rising then and dikes were constructed to keep the water from the low lying buildings. 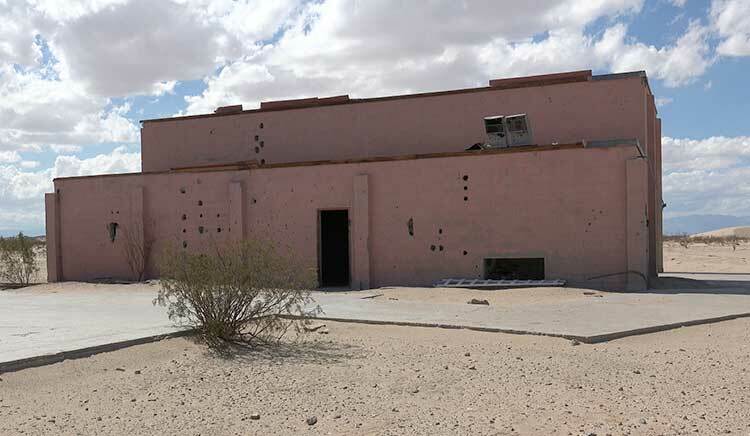 There's a rumor that the location was used for live munition training for the Gulf War of the 1990s. Certainly some of the buildings look as though they may have been hit by heavy munitions. 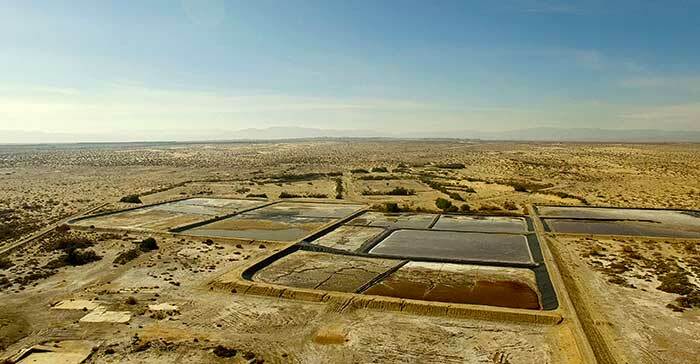 As of September of 1993, the Salton Sea Test Base was on the base closure list and the EPA performed a Hazardous Waste Assessment. In late summer of 1997 the Navy transferred the property to the Department of the Interior. 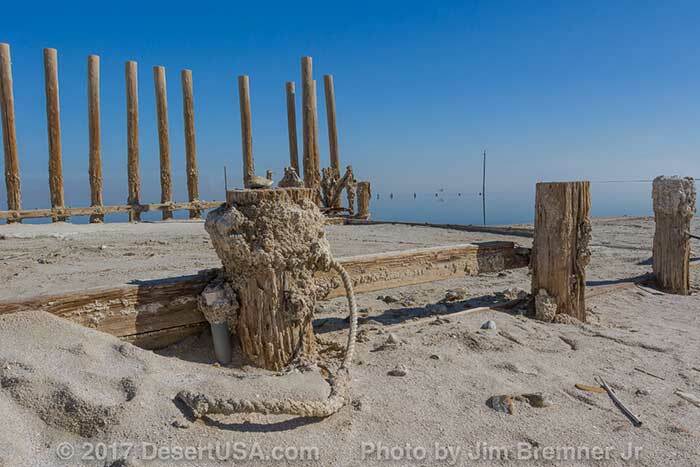 You can read the Navy's last Salton Sea Test Base Fact Sheet here. All the the dikes protect now are the old foundations of buildings. 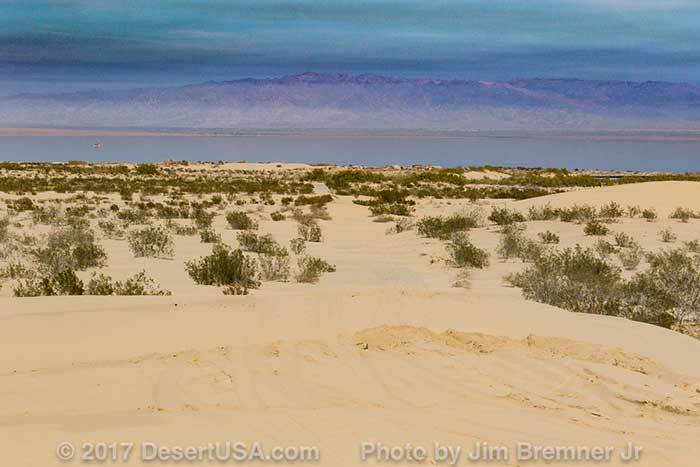 From July 2000 to July 2003, the U.S. Department of the Interior and the Salton Sea Authority researched reducing salt levels in the water with evaporation systems. That effort left pits lined with black plastic sheeting which still looked in pretty good condition in 2017. 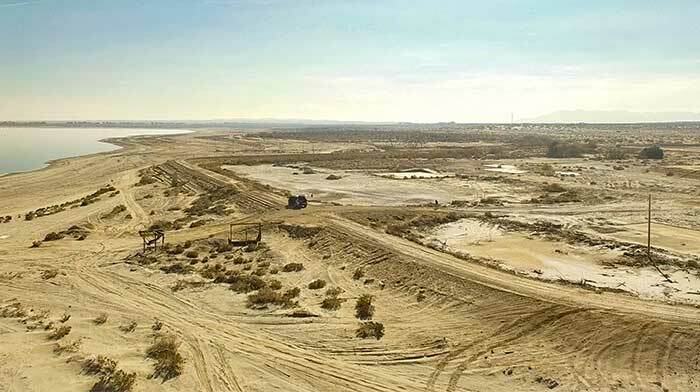 The future of the Salton Sea rests with the California legislature which hasn't approved a plan to improve the area, instead just funding another study. The evaporation pits were lined with black plastic sheet. We followed the road through the evaporation ponds, onto the dikes and down to the remains of the pier. There were the vestiges of two buildings on the beach, and lots of birds. Here's how it looks today. Each bird has its own post. There's lot of history here. You can imagine pretty well what it must've been like during the bombing tests and all the other tests and training that went on here over the years. Now it's just a landing place for birds on their way to other turf. With the future of the sea in doubt, who knows what the future may hold.